Two years ago Morgane Gay walked on to the Whitman High School cross country team just as any other girl might. Although she was always athletic, no one knew that this girl who could barely run a mile would eventually become a county, region, and state champion in a variety of distance events. After completing her first cross country season, she teamed up with three soccer players to win the county 4x800 title. She got her first taste of national competition when her "E-Squad" raced the relay at Nike Indoor Nationals (NIN). An injury set her back during outdoor track but she surprised nearly everyone when she won the county cross country title last October in a time of 18:14. From that point on she never lost a 1600m race to a Montgomery County athlete and lowered her best to 4:55. 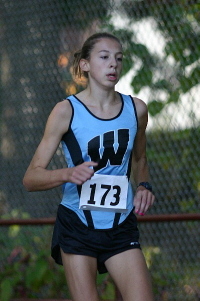 She is largely considered the best distance runner in Montgomery County entering this cross country season. Get to know what Morgane thinks about her ascent to the top including how she got there and how she is approaching this upcoming season. MoCoRunning: Did you participate in any sports when you were growing up? Gay: Yep, I've always been doing a sport. When I was little I did ballet for a couple years, but I decided I hated classical music and I needed something more active, so my mom put me in gymnastics at the age of 6. Then I was a competitve gymnast for 10 years. I was college bound, but then our gym started to fall apart and I was no longer having fun. SO I started running a week before practice started before my sophmore year. MoCoRunning: So where does running fit into your life nowadays? Is it all you ever think about or still something that you do just to be active and pass the time (or somewhere in between)? Gay: I have just gone out and run for fun during the summer. I stick to a basic training schedule that my coach gave out with a certain level of mileage, but I just enjoy going out and running. I definitely think it has become a part of me because it is a lifetime sport. I know that in the future, no matter where I am or what I am doing, I will be running. I've always been really active, so it gives me a chance to do exercise. It's SO fun because I love my team, and it's just a way for me to challenge myself and see how much I can improve. MoCoRunning: Do you think that there was a turning point during your high school career where you realized that you could lead and win races? When do you think that occurred and how did you come to that realization? Gay: Hmm, thats a tough one. I'd have to say that the turning point was after counties in indoor this past year. I definitely needed to get my confidence up in races, and when I won the mile, that is probably when I got that confidence boost and started to change my racing tactics. Since the year before, I was way behind the top runners - Louise, Emma, Halsey, Cara. I went into my second year of running with the same mentality. It was only after I began to realize that I could run with the top runners that I began to lead races. Instead of waiting behind people until the end, I started to lead and hold on. The only case where that was a mistake was at States during indoor. I attempted to lead the race (disregarding the competition), and that just made it harder for me. That helped me become a better runner because it really made me realize that every race has to be different and you have to analyze the different aspects instead of going into it with the "whatever happens, happens - just run" attitude. I think most runners in their first years don't realize how much thought and focus has to go into a race. I never got to that point until that race in my second year in indoor, and from then on I've had much more confidence. MoCoRunning: What would you tell a younger runner who is just starting out who might not know how good they are yet? Gay: I would say that running is a sport where you just keep getting better. Everyone starts at the same point - where 2 miles is the longest run of our life ( I was there not long ago - 2 years ago to the date, where I started running a week before practice going into sophomore year). The longer you run, the better you get and the more fun it gets. It becomes a part of your life. So I would say just keep running. I'm a fan of the quote, "impossible is nothing," because there really isn't anything you can't do if you put your mind to it. Anyone who puts in the work and who has a passion for the sport will succeed! MoCoRunning: Is this summer any different than the previous summers now you are the defending cross country county and region champion? Gay: This summer is pretty much the same. I'm just going out and running (although now, since I have become close with some other runners from different teams I run with different people everyday. It's a lot of fun). But I still go out and run just as I did last summer. The only slight difference is that now I know what's at the end of the tunnel. I know the rewards of all the hard work and it pumps me up for the season. MoCoRunning: You have won county, regional, and state titles. You have also had victories at major invitational meets in this area and in New York. You have been a part of some record breaking and All-American relay teams. In cross country or track, what is your single proudest accomplishment? Gay: Well I know this might not be exactly the answer you are expecting. It was amazing to win those races, but for me the most important thing has always been improvement. I started out never having run in my life, and in just 2 years I changed times dramatically. I went from a 23 minute 5k to an 18:14, and a 7:30 mile to a 4:55. For me that will always be my best accomplishment...looking back and seeing how much my times have gone down. As long as I continue to run my best and improve, I will feel a sense of accomplishment. MoCoRunning: When you run in the 4x800m relay, sometimes you are the leadoff leg and sometimes you are the third leg. Why might the order change from meet to meet? Which leg do you prefer to run? Gay: Well I started out the 3rd leg and I always loved running that leg. I always got to handoff to Leslie and that was always my favorite part. We had this tradition where when I was running down the last stretch, she would put her arm out and say, "come on, come on," to encourage me. That always worked for us, but then Coach Hays put me first leg for a meet and the relay seemed to do better with me and Les on first and last legs. I think that I will probably stay that leg, but my favorite leg will probably always be third. I love handing off to Leslie. MoCoRunning: You are of course referring to your teammate Leslie Morrison who I am sure you would agree is still the star in the 800. Did you ever feel overshadowed by her early on? How did training and racing with her affect you in terms of strength, confidence, and character? Gay: I never really felt overshadowed. When I came into my sophomore year and she was already a star, she was always an inspiration for me and running with her was beneficial because it made me a better runner. We ran workouts together and we have worked together on relays to perform the best for the team. We help each other during the workouts and we are really close as teammates (and friends since we are practically neighbors). Having her as a teammate has been really good for both of us because it pushes us to be better runners. We mostly run different events. I am more of a distance runner and she is more of a shorter distance runner - 800. MoCoRunning: Do you hope to return to the Northeast Footlocker Cross Country Meet this year? Have you thought of any strategy to try to improve on last year's performance? Gay: I do hope to return to Footlocker. Last year was a very good experience for me even though I didn't perform well. I was there alone and had never been in a huge meet before in cross country. I think I was overwhelmed with how fast it went out. I'm used to a different racing strategy. This year I will have run before, so I hope to improve on my time and place. MoCoRunning: What is better: The new blue and black Whitman uniforms, the E-squad uniforms, or the Pwn3rs TC uniforms?